We have already seen File2HD online service to quickly download files from any website. Xsite utility does similar without you having to open web browser. Just enter URL or website address and hit the enter key. You will get list of weblinks, images and email address associated with specific web address. You can easily view detailed information by clicking + sign on the viewer window. 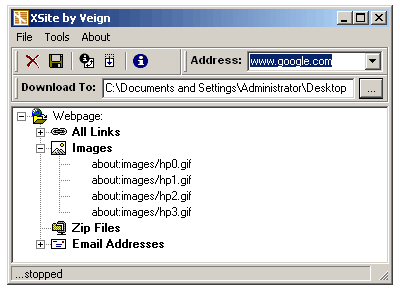 It also allows you to download any image with simple right click > download file procedure. It also allows you to download and save information displayed in text or CSV format. Download XsiteÂ [link] to parse any webpage and push related information in any database. It is simple and very easy to use. How to download old Bing homepage wallpaper photos?